We had dinner at our friends' farm a few weekends back to celebrate their birthdays. I had a lovely talk with one of our hostesses about their beehives, which were just a few dozen paces from where we ate supper in the yard. Jane and Henry were enamoured with the chickens pecking and scratching behind the barn. 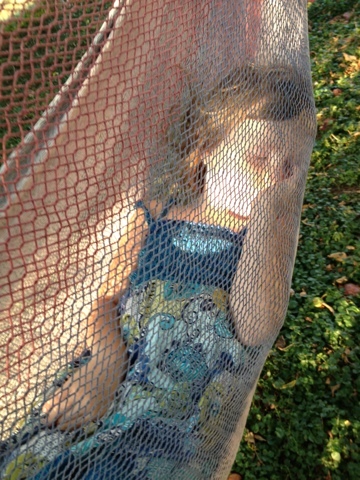 Alice was more a fan of the hammocks, of which they had three suspended between trees in the shady side yard. Here she is about ten minutes after I told her we would be leaving in five.